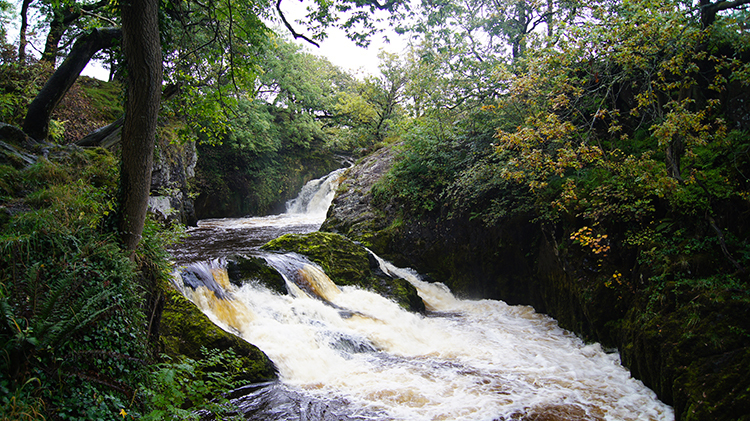 Important: This walk must be paid for as the Ingleton Waterfalls Trail is privately managed. See the official website for details. I was staying in Ingleton for a week with my friends Steve and Jan. While I had designed some upland walking and fell walking for our week in the area I had also designed a couple of walks suitable for wet days. This was the first choice for a wet day. 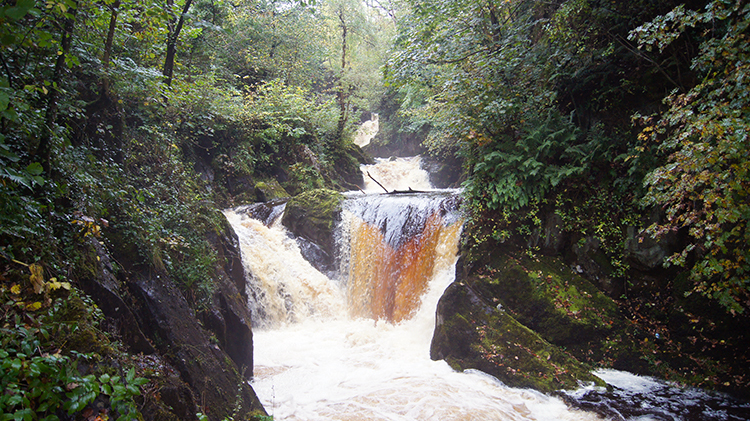 I had walked the River Twiss section of the Ingleton Waterfalls Trail with Steve during a long distance walk in 2004. 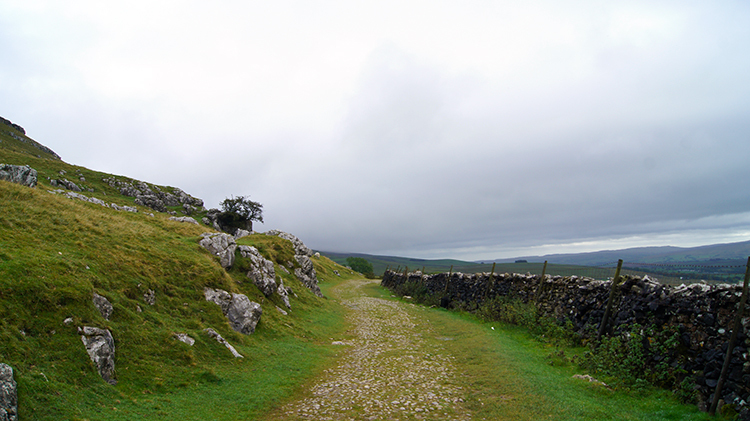 And I had walked the River Doe part of the trail on walks when returning to Ingleton from climbs of Whernside. I had not done the trail in its entirety before though and so, after paying the entrance fee to the trail, we set off on our way be ambling along the path into Swilla Glen. 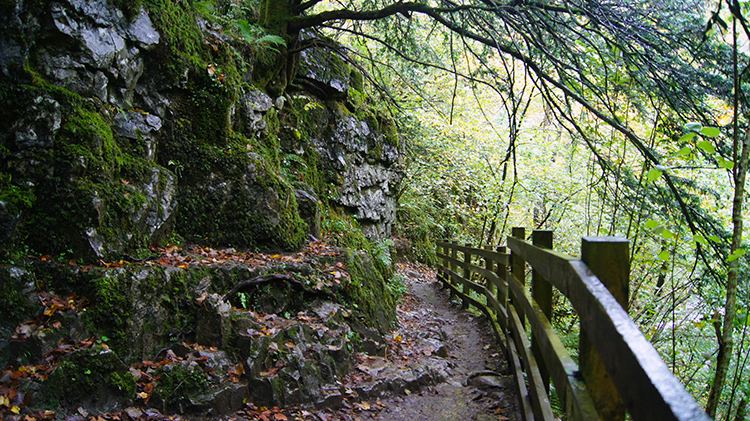 Swilla Glen has been shaped by the River Twiss cutting through carboniferous limestone over time since the last great ice age. 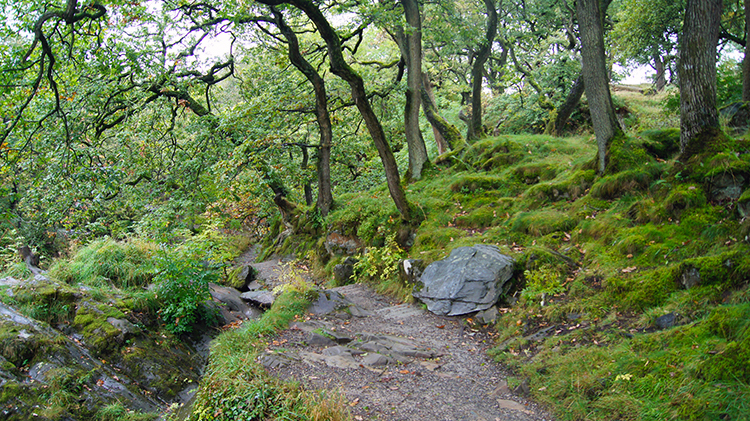 Enclosed within the glen and encroaching on the river from both sides is a lovely and varied woodland of many native trees including Oak, Ash, Birch and Hazel. We came to a fallen tree which, like many fallen trees in popular and much walked woodland, was covered in coins hammered into the trunk. 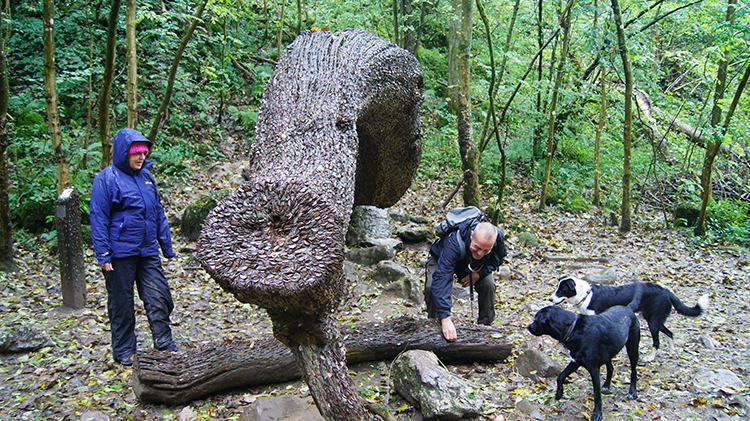 The trail management team have creatively called it the 'Money Tree'. We added to its value before continuing our walk through Swilla Glen which at times took us up and down steps while rounding cliffs and crags surrounding the glen. all exposed and elevated paths were well fenced. 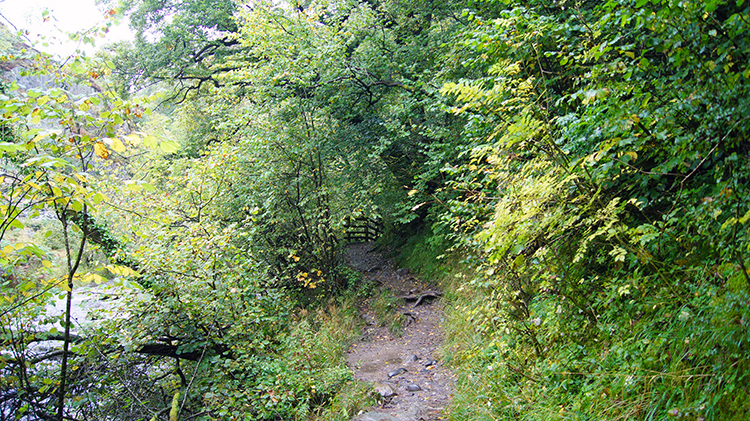 The trail management do a good job to keep the walk as safe as is reasonably possible. 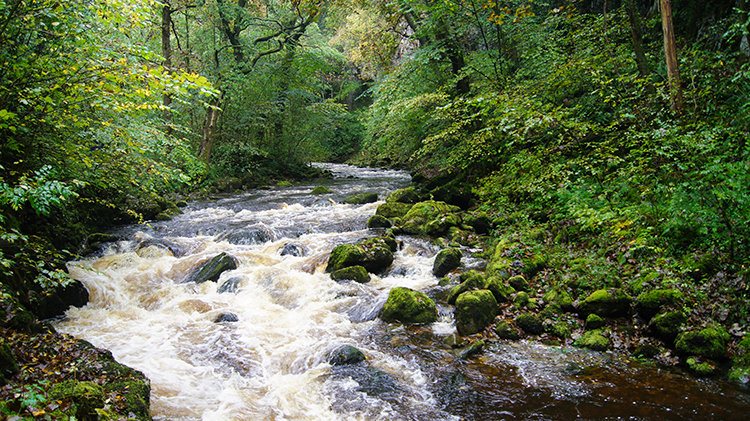 We continued through Swilla Glen in a northwards direction by following the River Twiss upstream. As well as admiring the woodland and when we came to the waters edge I took on duties of watching Steve's dogs while they played in the safer parts of the river. Dogs invariably love water. Keira and Ziggy certainly did. While the dogs had fun paddling I looked around at the woodland and to the varied greens of the ferns encroaching on the waterside and the mosses covering the boulders in the river. Few stones were bare. At Constitution Hill the enclosure of Swilla Glen abated. More light was cast onto the trail as we passed Constitution Hill. It was a temporary spell of brightness for once we were on the north side of the hill the high sides of the glen closed us in again. Being closed in by the glen and the dense woodland encroaching within the confines of the cut caused by the River Twiss caused us to focus on the immediate surroundings once more. and that was not difficult to do because coming into sense was the first waterfall highlight of the trail. At first we heard it. Then we saw it. The majesty of Pecca Falls was upon us. At Pecca Falls the woodland subtly changed too as we walk from an environment of limestone to one of softer slates and sandstones. Not that we noticed that too much. Our eyes were firmly fixed on the beauty of Pecca Falls which was made more dramatic by the red and brown peat colour of the water caused by overnight rainfall. We were enjoying Pecca Falls at their glorious best. 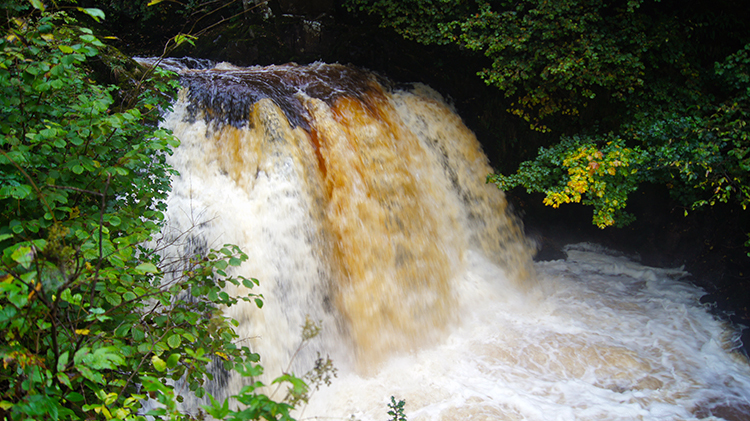 Pecca Falls is a series of five waterfalls, each one slightly offset from its neighbour. They each flow over sandstone steps and it is a fact that the drop pools of each waterfall is relatively the same depth as the drop. Not that I have ever tested the fact out. We stood in awe looking with fixed eyes on the beautiful picture. Steve and Jan drew themselves away first. I found it very difficult to do so. From the enclosure of the natural cinema which makes the sight of Pecca Falls so amazing we began to climb from the narrow glen to a higher path which took us through a disused quarry and out to the open moor. We passed Cuckoo Island in the now gentler river and continued on a good path to round a bend in the river which took us from a northward to eastward direction. This change of direction took us to a spectacle I had wanted to return to ever since that long distance walk I mentioned earlier. I was back at Thornton Force. It is a magnificent waterfall which plunges 14 metres over a limestone cliff which formed over 330 million years ago when this place was a sub-tropical sea. 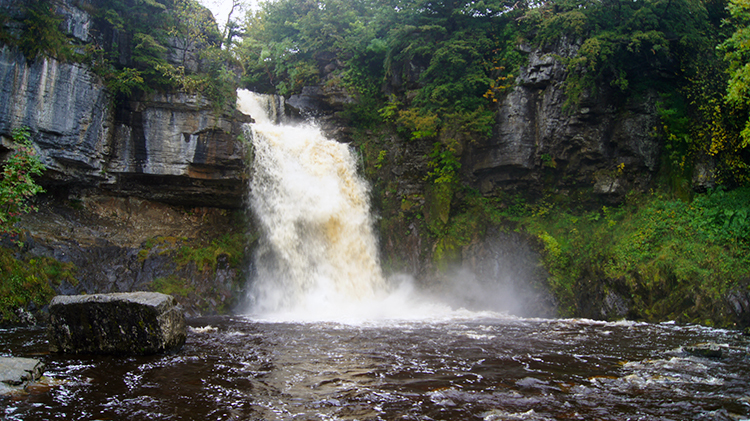 Thornton Force is in such a beautiful setting which inspired JMW Turner to paint it. His interpretation is slightly different to mine but evocative all the same. 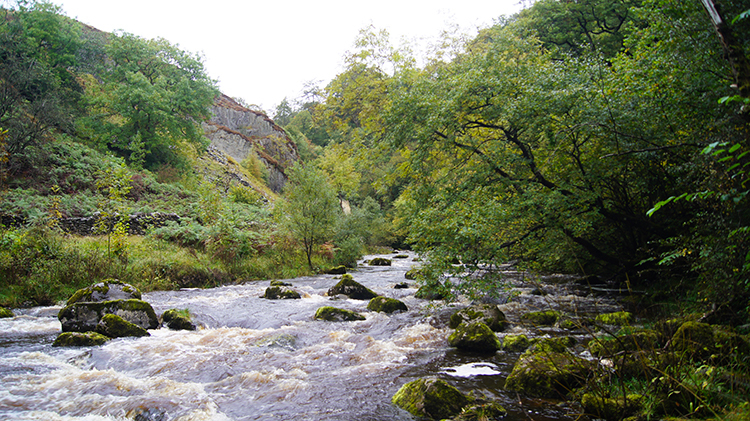 After the drama of Pecca Falls and Thornton Force we needed a quiet interlude and we got one as we walked steadily on a climb following the much calmer River Twiss upstream to Ravenray Bridge. 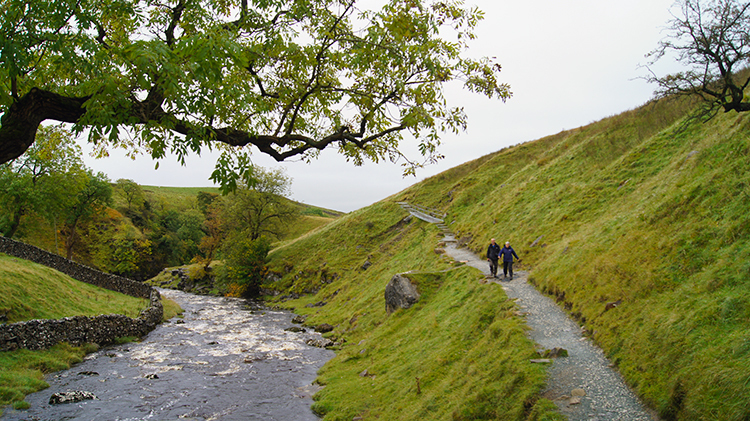 We crossed the footbridge to leave the river and follow a bridleway to the highest point of our walk, at near 300 metres high, around the natural contour on the south edge of Twistleton Scar End to Twistleton Hall. 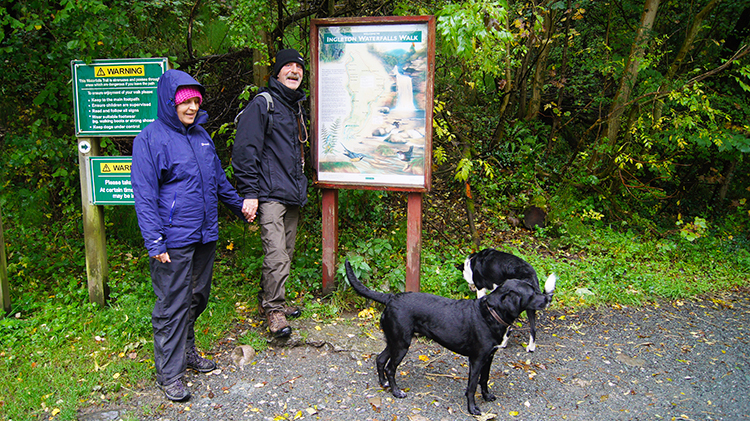 After passing through the grounds of the hall and having curved a full half circle since Thornton Force we crossed Oddie's Lane and came to the second installment of the Ingleton Waterfall Trail by passing the cafe kiosk at Beezley Farm and joining a path leading down to the River Doe. After carefully walking down a stepped path to the rivers edge we walked a short distance to view our next waterfall spectacular. 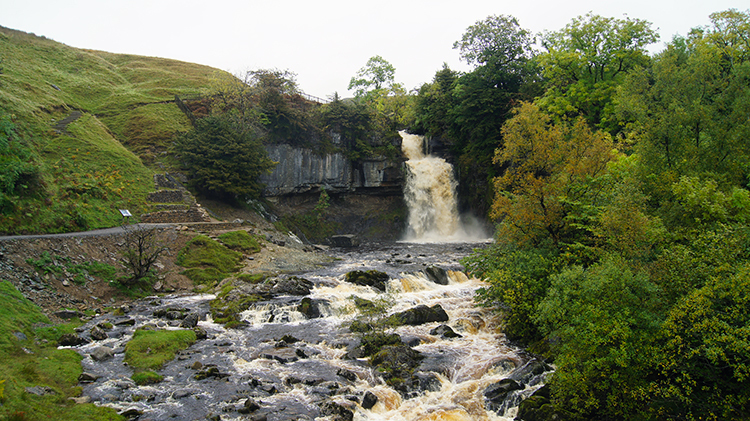 Beezley Falls are a series of waterfalls that tumble down from the flat ribboned dale which stretches from Chapel-le-Dale to Twistleton and which is enclosed by the iconic mountains of Whernside to the north-west and Ingleborough to the south-east. The first fall is a single drop which is enjoyed before walking further into Doe Woods by way of carefully trodden paths. 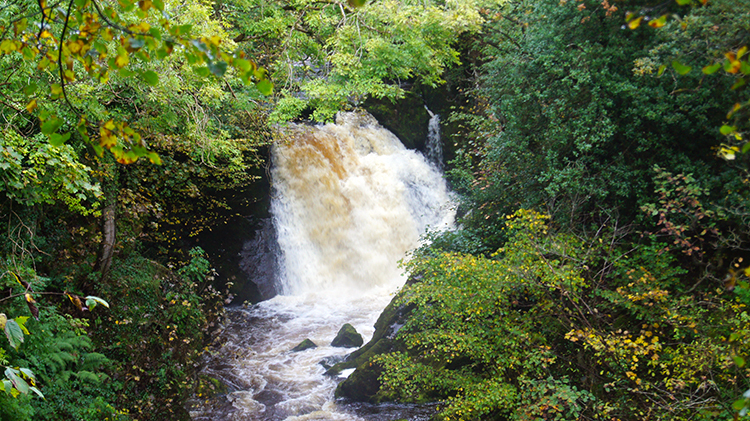 After climbing up and over a small crag the second part of Beezley Falls can be viewed. Affectionately known as Triple Spout a parallel line of three cascades tumble down the River Doe to another section of falls which are known as Rival Falls. You can get close here as a path elevated beside the river runs right alongside. 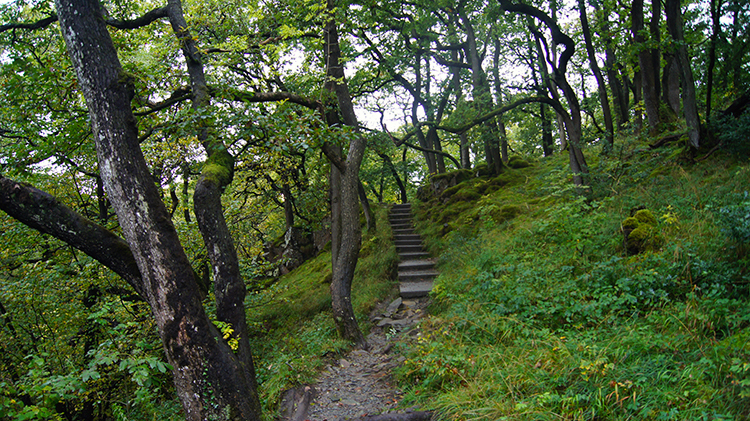 It seems the waterfalls are none stop on this section of the walk and stepped walkways, some of stone and some wooden constructions take the path in, around, up and over small crags to reach stunning viewpoints. Rival Falls eventually plunge into Black Hole which is reputed to be over 80 feet deep. And still we continued on taking in one thrill after another. 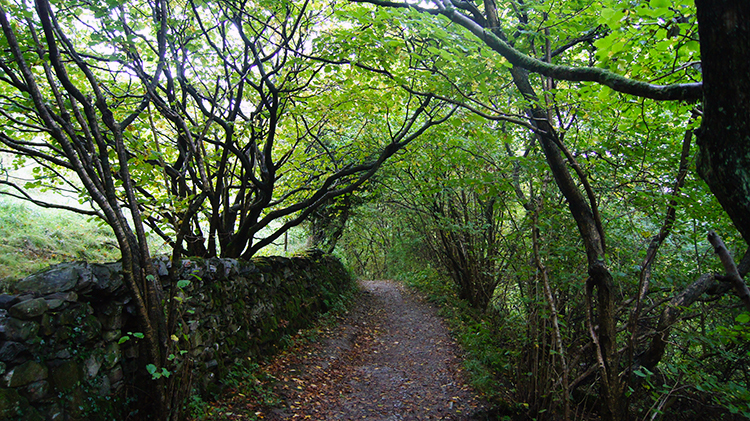 The path continued on its up and down course through Doe Glen and up and over woodland crags towards Ingleton. After Rival Falls we had one more notable waterfall to enjoy when after walking a little further down the glen we enjoyed a great view by stepping on to a footbridge and admiring the cut of Baxenghyll Gorge and the beautiful cascade of Snow Falls. 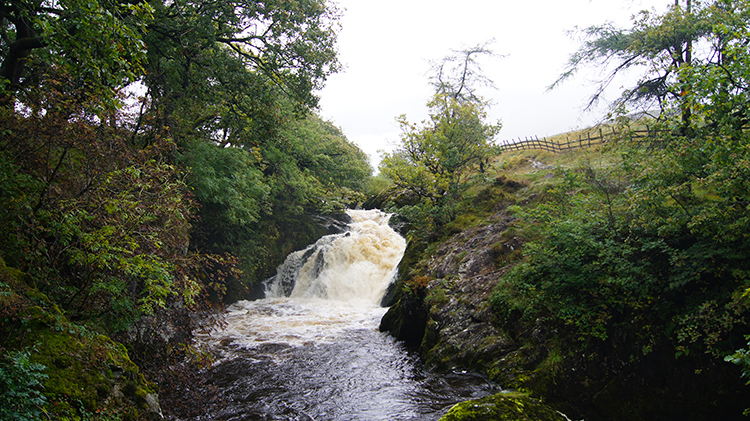 The Ingleton Waterfalls Trail promises a lot and it certainly delivers. Soon after admiring Snow Falls we left the riverside to complete our walk through woodland and then past the site of disused limestone quarries and kilns. The industry of the past on the site has replaced by the leisure of adventure. 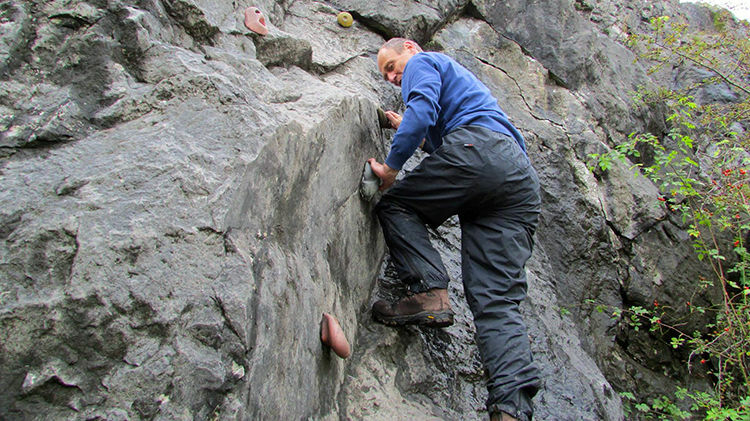 I noticed a rock face had climbing wall hand-holds and footholds impressed within it. I simply had to have a go. I must have got five feet high before leaping back down! The climb was just a temporary diversion of fun. 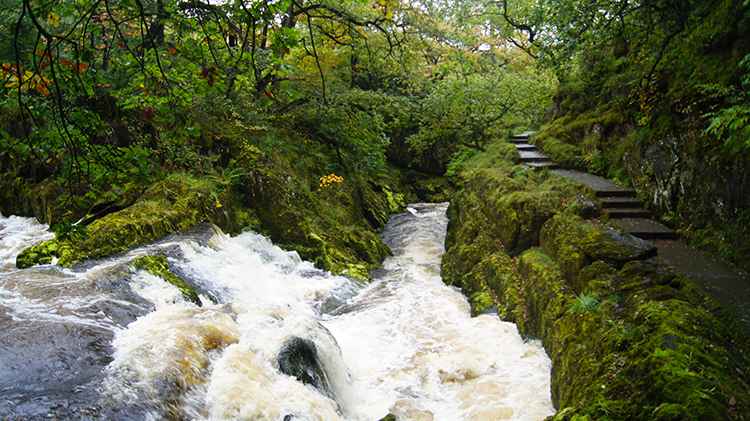 The walk of the Ingleton Waterfalls Trail is a permanent imprint of beauty. I have always had a passion for waterfall trails and by finally getting around to walking this splendid trial has only reinforced the passion. Marvellous.